An EN2 system includes a Central Control Unit (CCU2EN), and up to 16 Push Button Stations (4 maximum per channel). An EN4 system includes a Ped Head Control Unit (PHCU4W), and a Push Button Station. 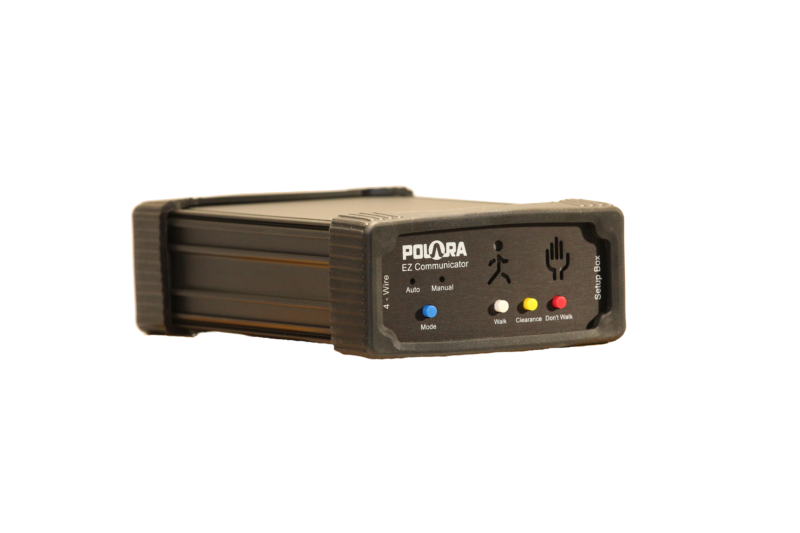 Polara’s Configurator (ECONFIG) or PC Toolbox allow the customer/installer to easly configure all of the desired features on both systems. Cuckoo, Chirp, Rapid Tick, Verbal, or user customized voice messages during walk. A total of 10 walk sound options are included with an additional 2 locations for custom voice messages/walk sounds. Choice of 4 locating tones, custom sound, or verbal countdown during PED clearance. Most sounds have a minimum and maximum volume setting option. An extended button push can turn on, or boost volumes. Custom audio messages and configuration settings can be easily changed via USB port. On the EN2, sounds are synchronized across all PBSs. On the EN2, an extended button push can mute all sounds except those on the activated crosswalk. The EN2 system can provide pre-configured special messages played throughout the entire intersection upon a central system activated signal (preemption). 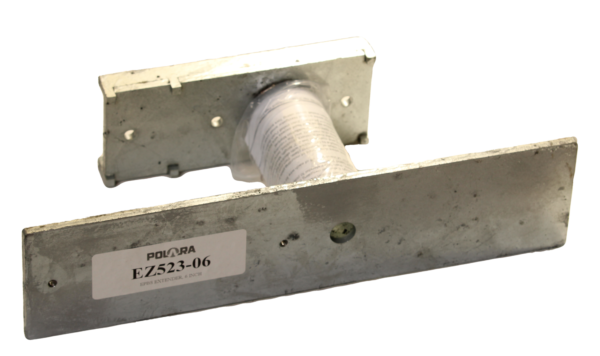 An EN2 system is designed for use on intersections with existing button wires and provides the maximum features and performance possible. A Control Unit installs in the intersection Traffic Cabinet and coordinates the performance of each PBS over the existing two button wires. All sounds are synchronized and special functions such as preemption messaging, muting of sounds, ping pong (alternating) of sounds and other features are available. An EN4 system is designed for intersections where button wires do not exist, but can also be installed on intersections with button wires. 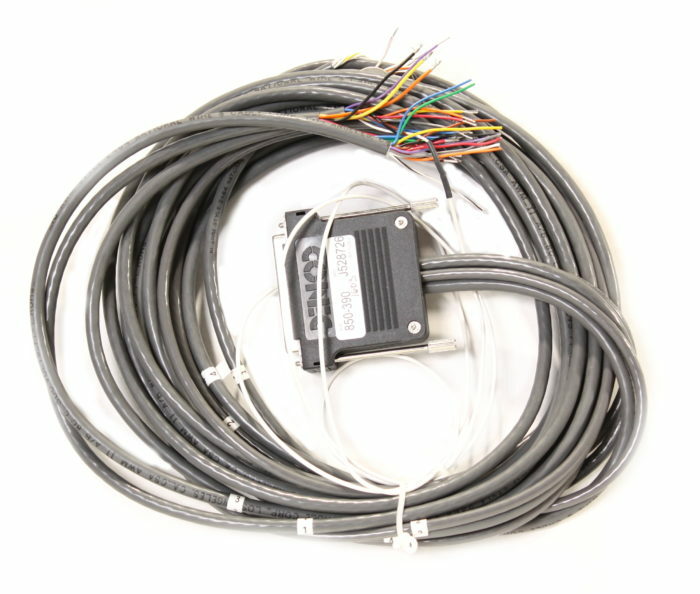 A Control Unit installs in each Pedestrian Signal and connects to a PBS via 4 wires. 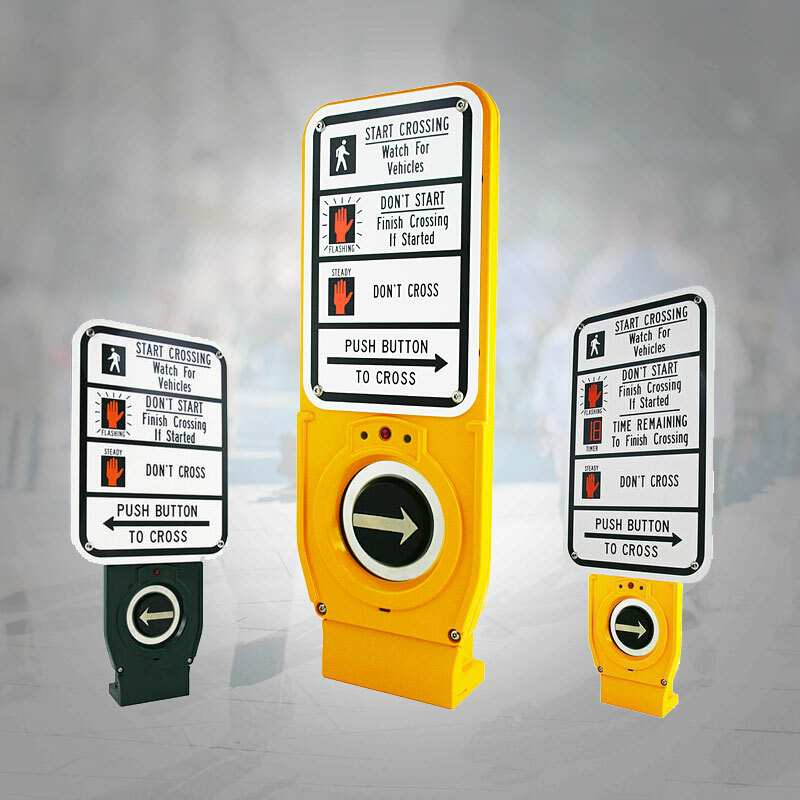 Each system is independent of the others and each PBS responds to the messaging provided by the Pedestrian Signal Head it is connected to. The sounds are not synchronized and some of the features on a 2-Wire system are not available. NOTE: The EN product line and iN product line are not compatible. 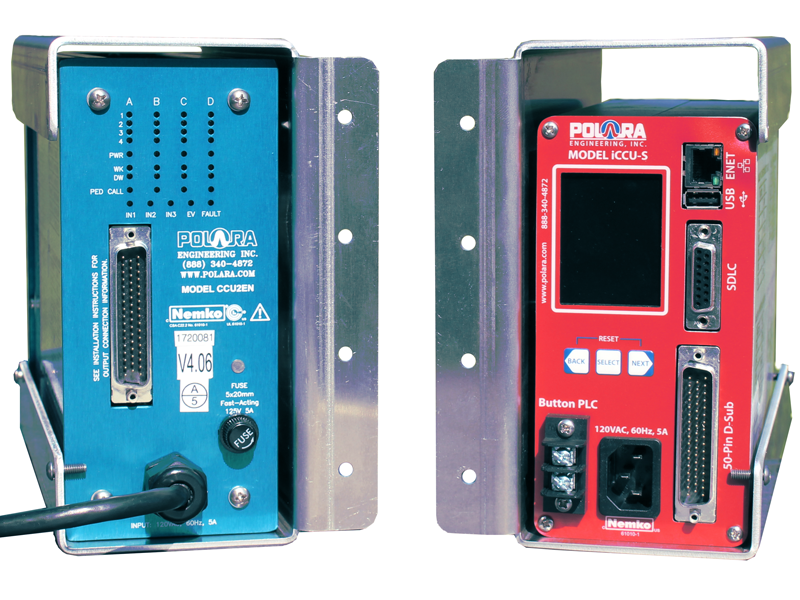 Polara will continue to support the EN product line for years to come, but for new installations it is recommended you use the iN product line. Form for ordering EN Navigator push button stations configured as desired. 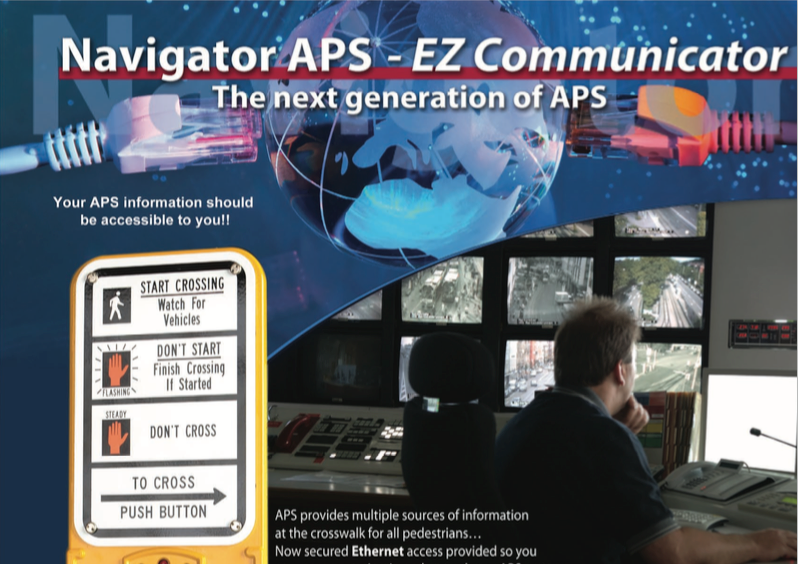 The CCU2EN is the Control Unit for the EZCOMM Navigator System, is installed inside the Traffic Cabinet and is powered by the AC supply mains (115 VAC). The CCU2EN is the power supply and signaling interface between the existing intersection Traffic Control Unit and Navigator Push Button Stations (EPBS). Part number for ordering is CCU2EN. 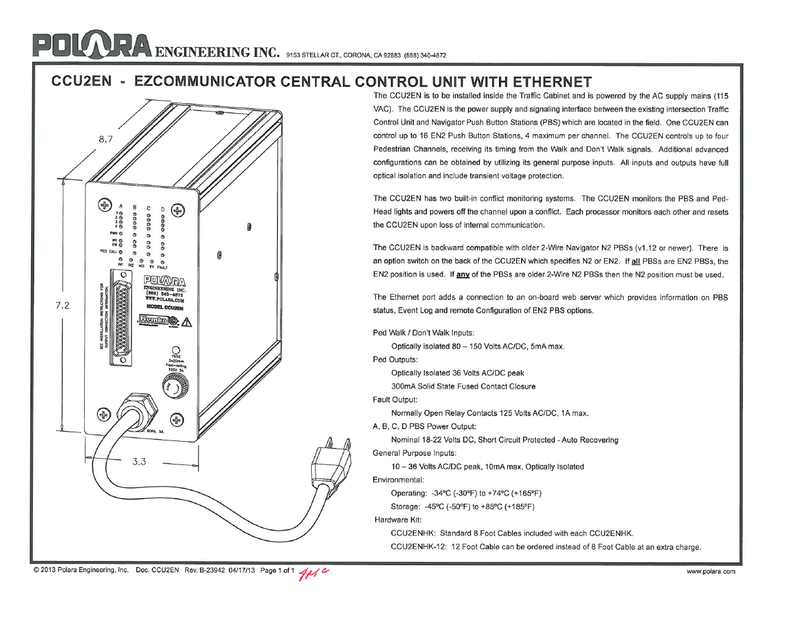 The CCU2ENHK includes the 50 pin connector/cable assembly, Interconnect Board, and Installation Instructions. 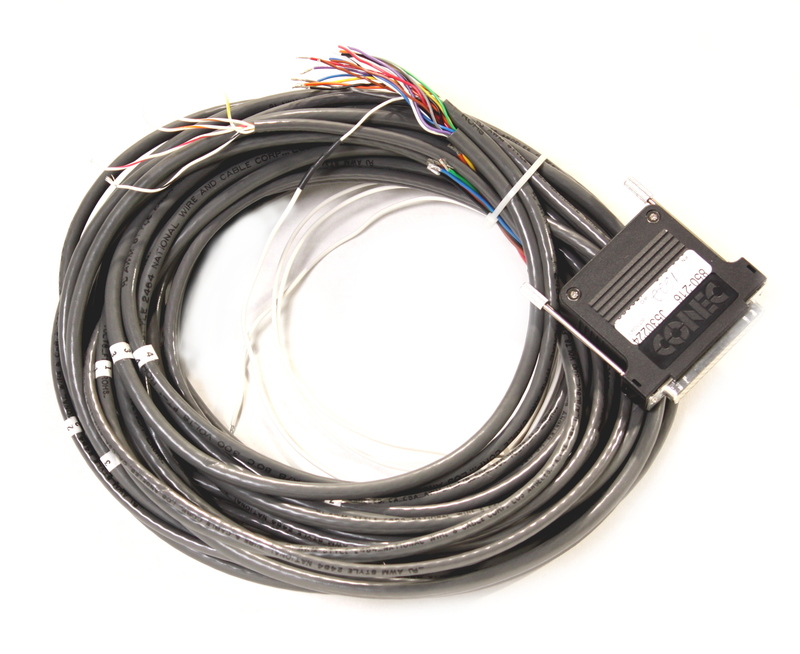 The cable assembly has 8' long cables for cable #'s 1, 2 and 4. Cable #3 which is for special functions and preemption is 4' long. Part number for ordering is CCU2ENHK. Same as CCU2ENHK but all cables are 12' long to facilitate installation in a double width cabinet. Part number for ordering is CCU2ENHK-12. 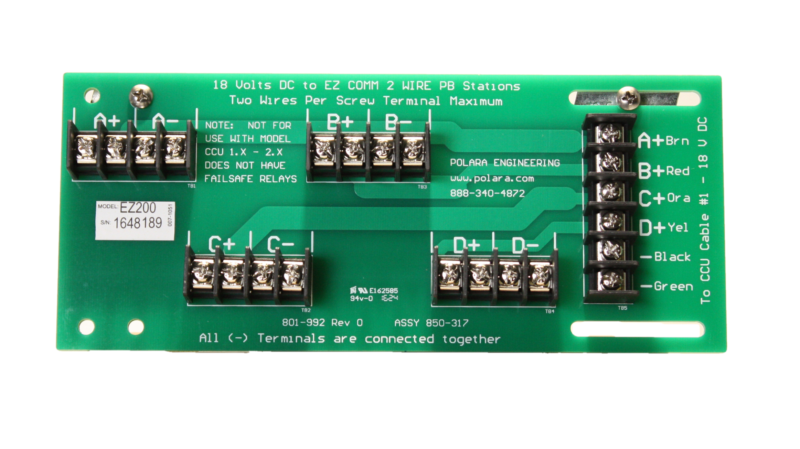 Same Interconnect Board that is in CCU2ENHK. 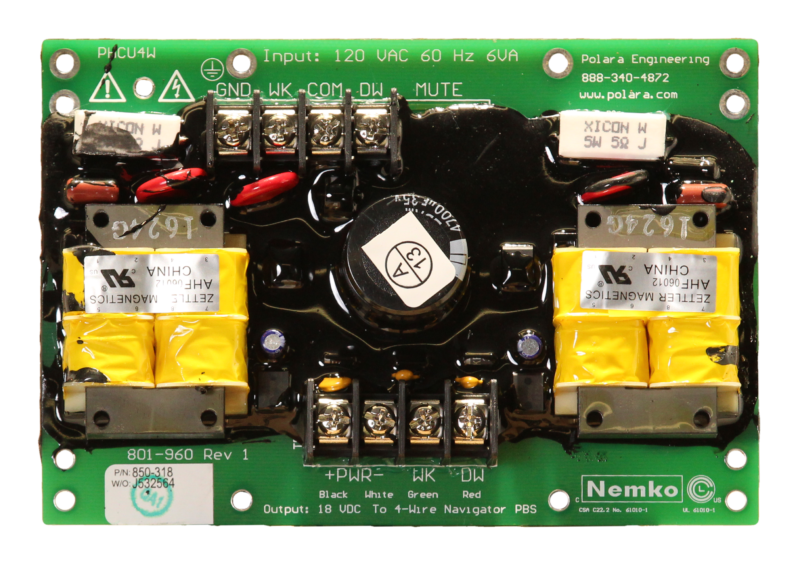 Can be ordered separately as PN 850-317. 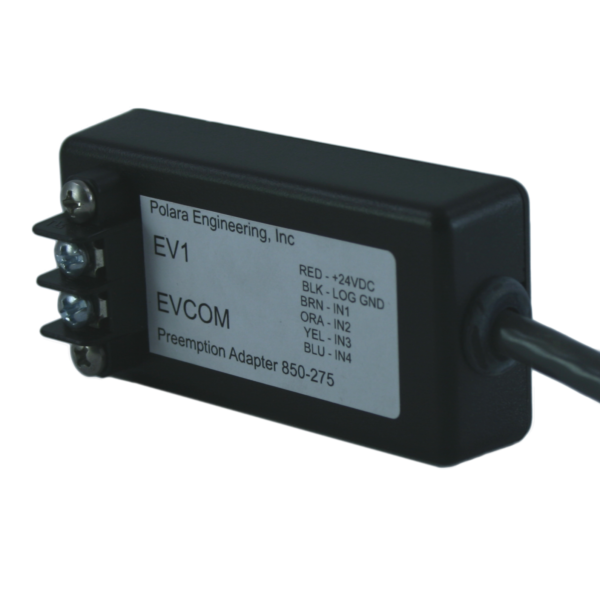 When the EV common is not the same voltage as the DC cabinet voltage supply, this adapter is required. 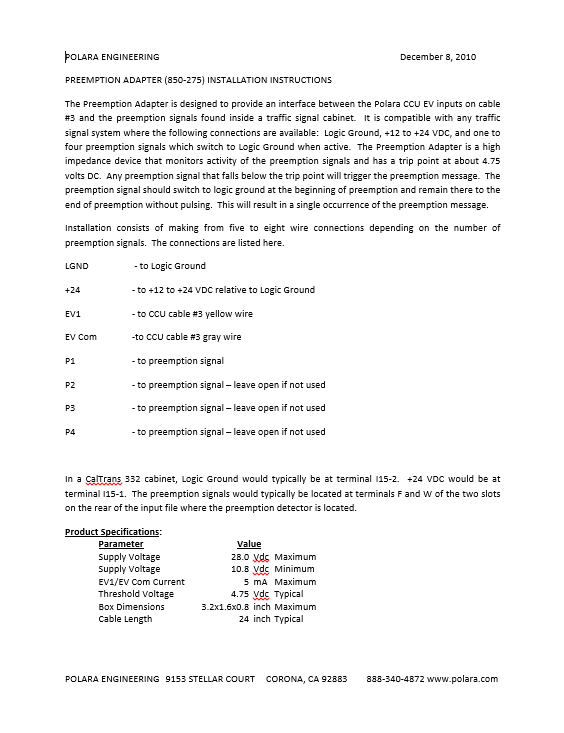 We are told that when an Opticom/GTT 500 or 700 series preemption system is installed, and the Navigator preemption broadcast message is desired, because the required voltage output is not provided by the Opticom/GTT equipment, this adapter is required in order to make the Navigator broadcast message play correctly. 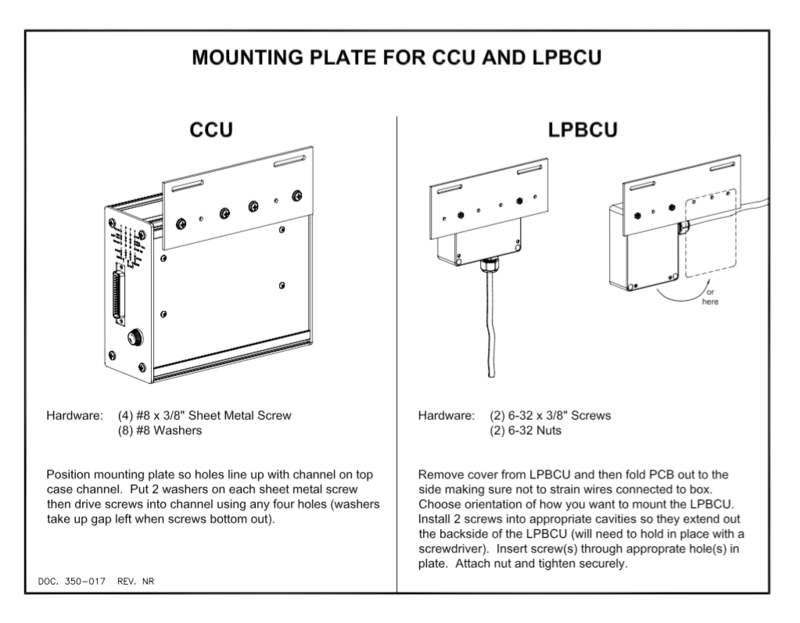 This mount is designed to hold a CCU2EN or iCCU-S/BIU type control unit and bolt to a rack channel with EIA universal spacing. All features are mirrored so that it can be mounted on the left or right rack channel. 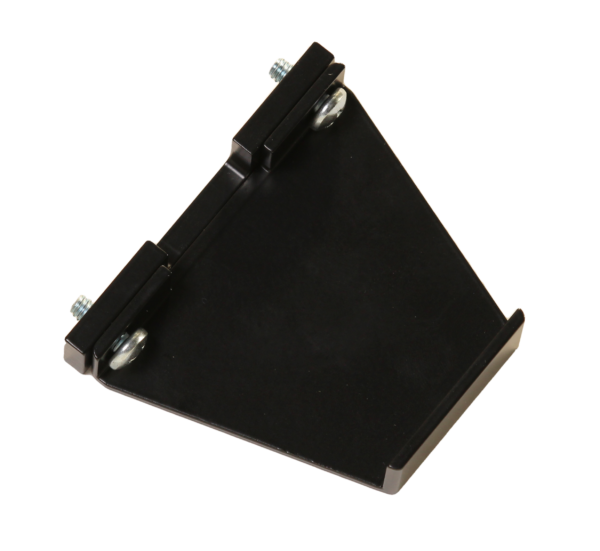 This adapter is used to mount two Navigator PBS on a 4” diameter pole so that two 9” X 12” (or 9" X 15") signs can be mounted without conflict. Set of two adapters with hardware is provided. One adapter is needed behind each Navigator. 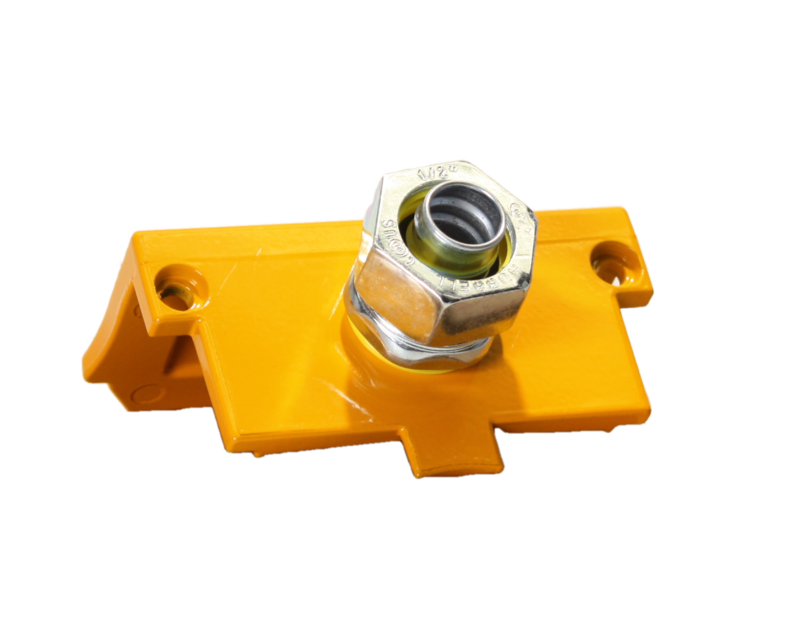 Part number for ordering is NPA4X2-X. To designate color in place of X use "B" for black, "G" for green and "Y" for yellow. 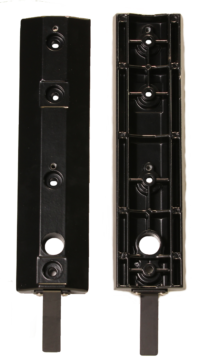 This adapter is a modified version of one of the NPA4X2 adapters designed to clear the flutes on fluted poles so a Navigator PBS can be mounted directly on, or up to 20 degrees to either side of a scallop. 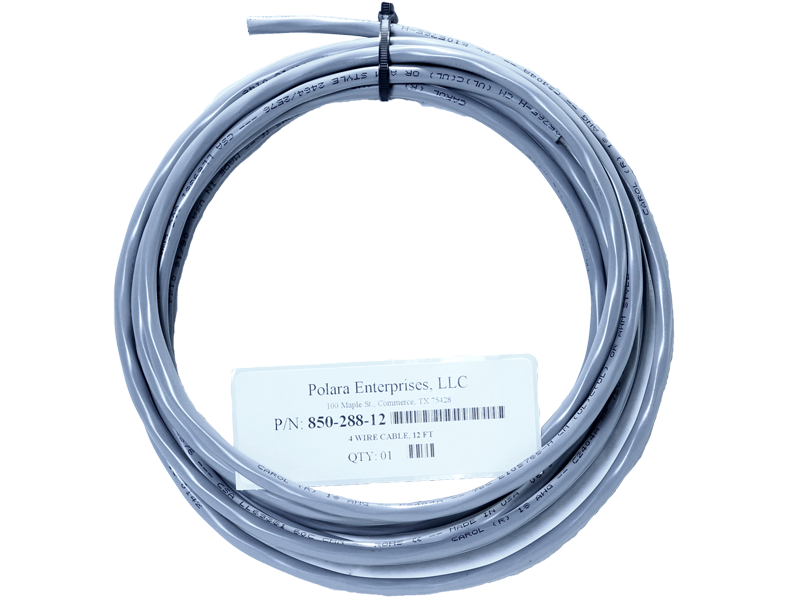 Because the flutes on poles can vary significantly Polara does not guarantee this adapter will work on every style of fluted pole. 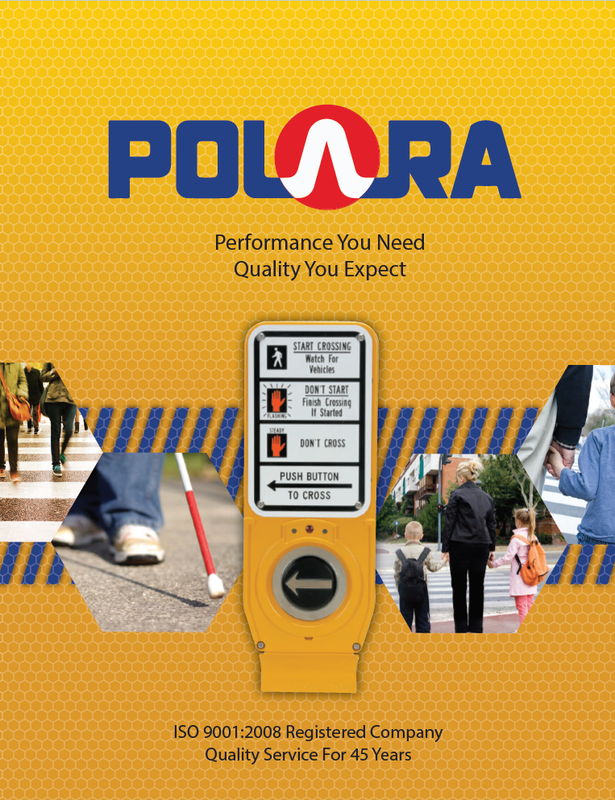 To the best of Polara's knowledge it has worked on every pole design so far. If you have a pole design where it does not work, please let us know and we will refund your purchase. This product is only offered in the color black. Part number for ordering is NPA-B-FP. 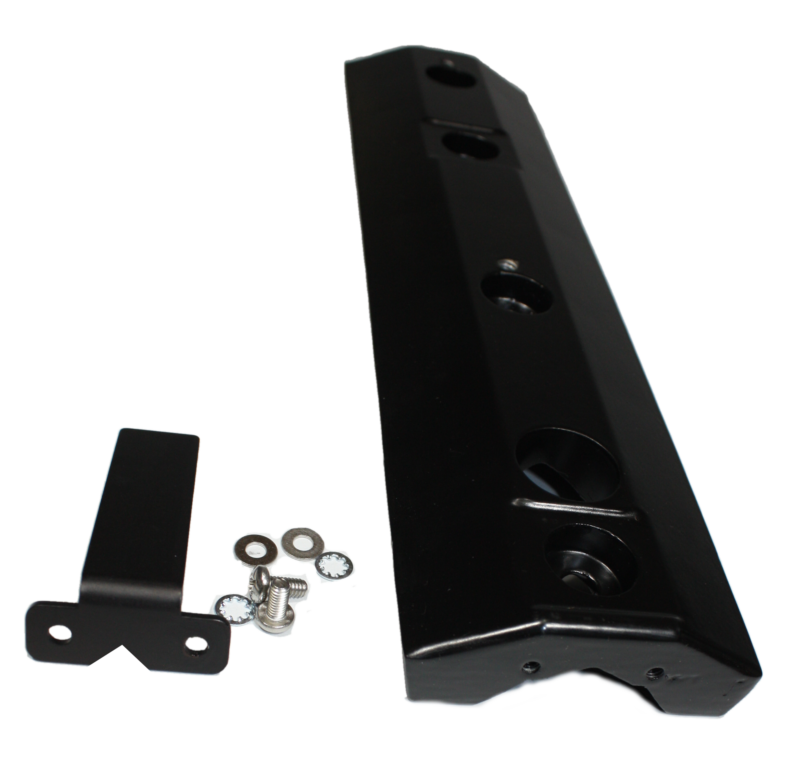 This pole cap is designed to attach to an EN push button station and cover the top of a 2.5 inch stub pole. The part number to order is ENWPC-X. To designate color in place of X use "B" for black, "G" for green and "Y" for yellow. 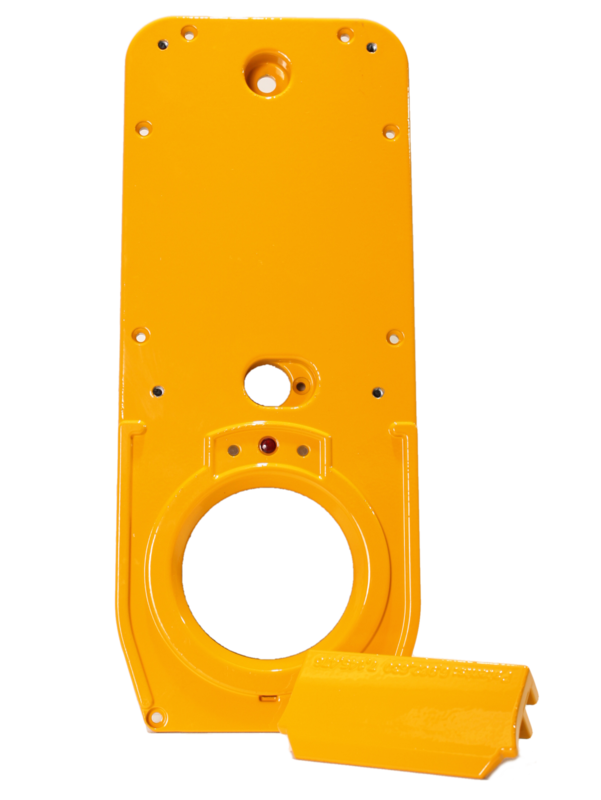 The EZ Navigator Pole Extender facilitates mounting a Push Button Station (EPBS) 6” or 12” away from the traffic pole, in order to position the EPBS closer to the start of the crosswalk. Standard sizes are 6" and 12" extensions from the pole. Made of welded steel with hot dip galvanize finish. 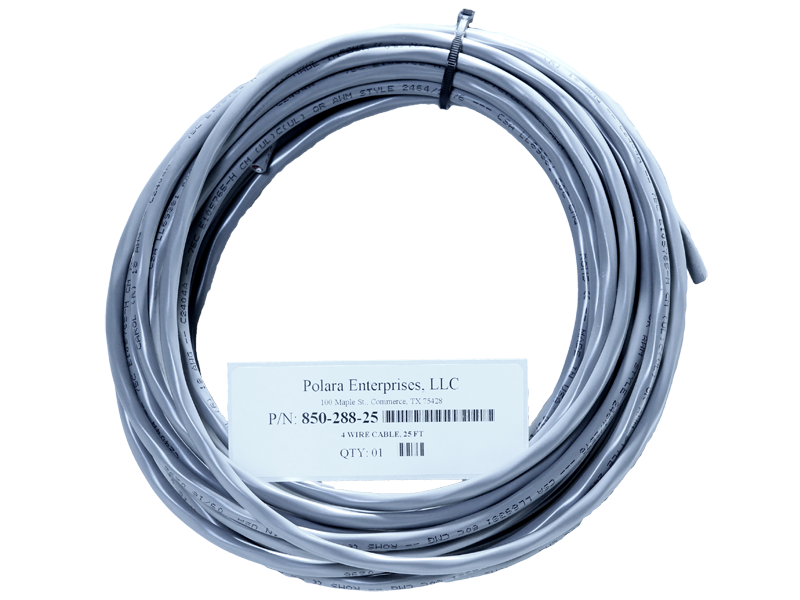 Custom lengths can be quoted and provided for minimum order quantities. 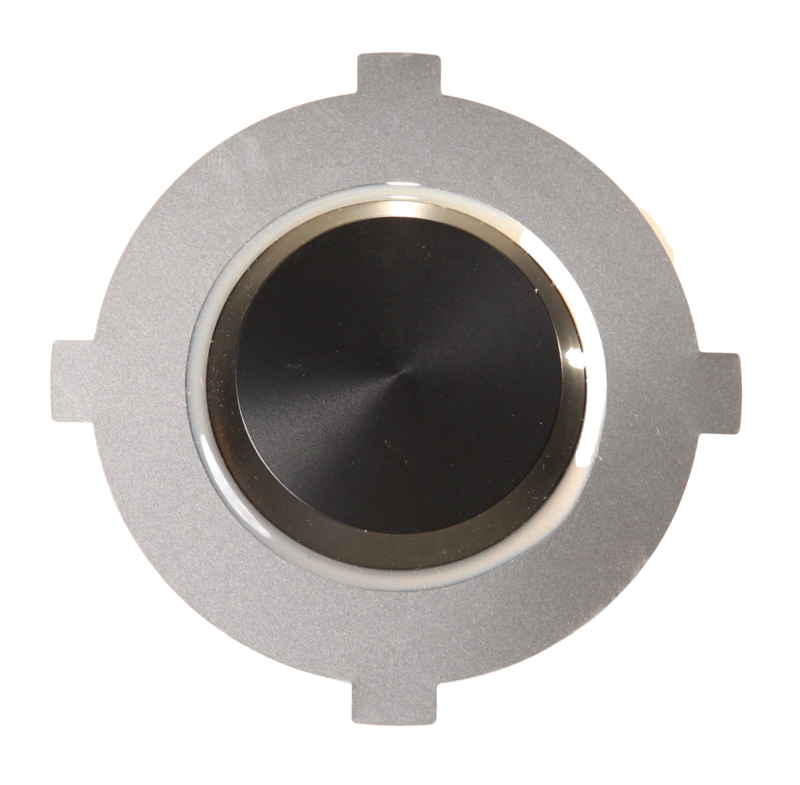 Part number for ordering is EZ523-06 for 6" and EZ523-12 for 12". This sign back plate is designed to be attached to Navigator EPBS or a Push Button Frame, for mounting 9” x 12” crosswalk sign. 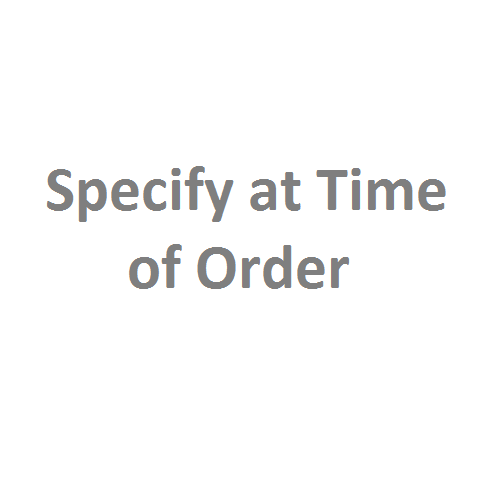 The part number to order is PBFA9X12-X. To designate color in place of X use "B" for black, "G" for green and "Y" for yellow. 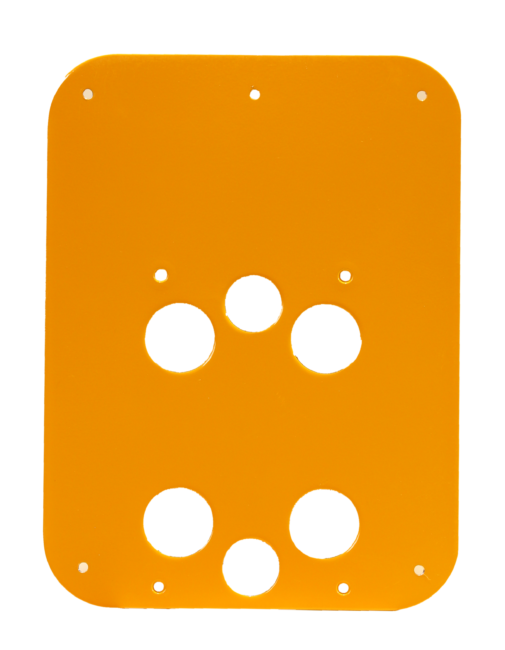 This sign back plate is designed to be attached to Navigator EPBS or a Push Button Frame, for mounting 9” x 15” crosswalk sign. 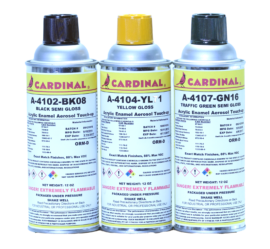 The part number to order is PBFA9X15-X. To designate color in place of X use "B" for black, "G" for green and "Y" for yellow. 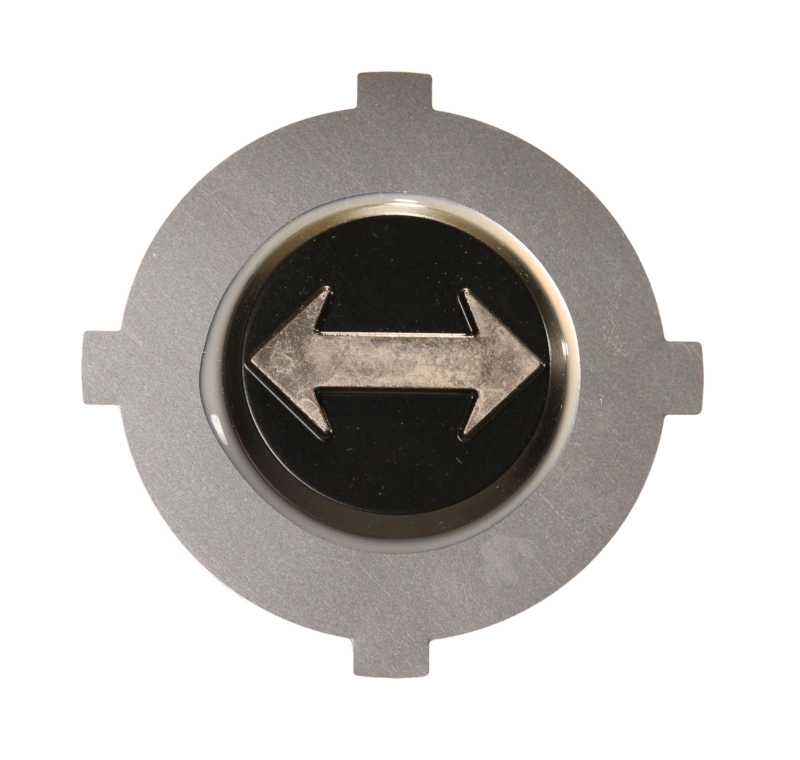 If you need to field replace a R/L arrow button, this assembly is for a bi-direction application. Part number for ordering is 850-278. If you need to field replace a R/L arrow button, this assembly is for a no arrow application. A typical application is a scramble intersection. Part number for ordering is 850-279. If you need to field replace a R/L arrow button, this assembly is the replacement button. Part number for ordering is 850-277. This speaker is for replacing an ENavigator speaker in the field. Included is a gasket and 4 mounting screws. The part number for ordering is 850-187. 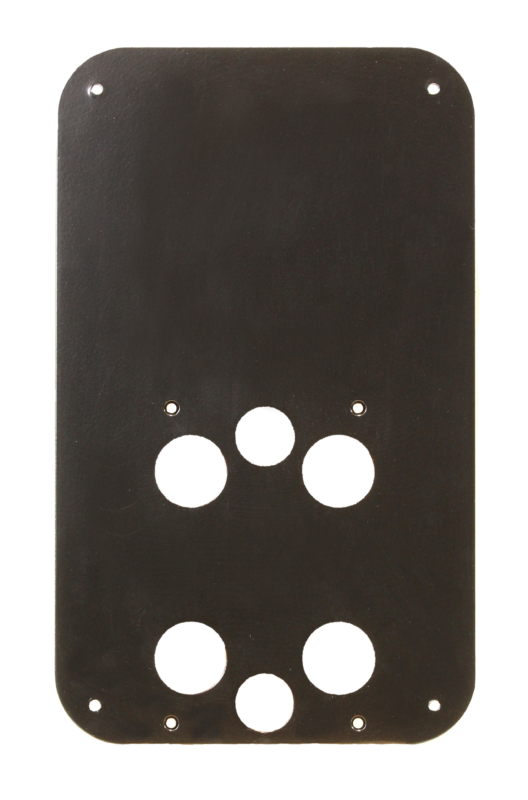 This Sound Baffle is a small external plastic part used to re-direct the sound from the EZ Communicator resulting in an approximate 10dBA reduction in sound projection on side of the unit it is installed on. 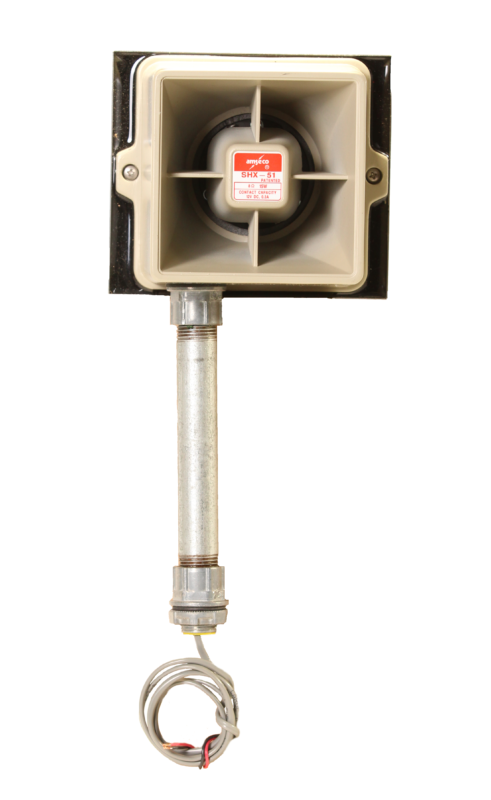 Ideal for use when a Navigator Push Button Station is installed near a home or apartment where sound might be disruptive to nearby residents. This color change kit is a bundle of the required parts needed to change the Front Cover color on an EZComm Navigator EPBS. Part number for ordering is EZ520-X. To designate color in place of X use "B" for black, "G" for green and "Y" for yellow. 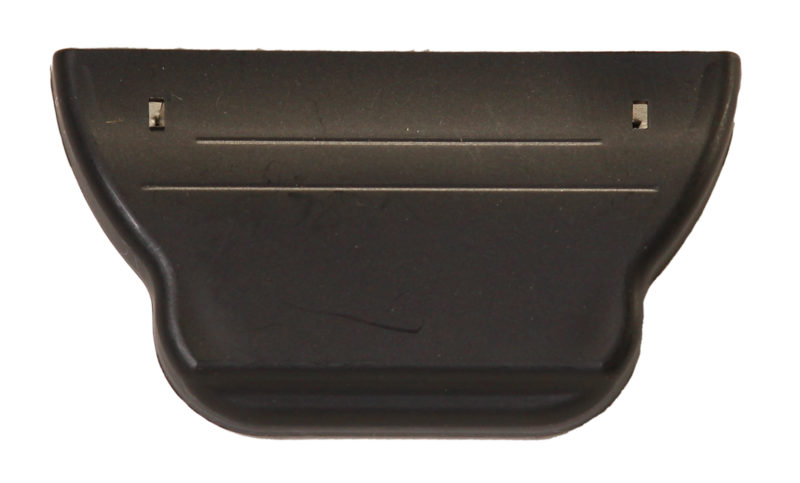 This cover is to facilitate connecting flexible conduit to an EZ Communicator Navigator Push Button Station (EPBS) when mounted onto a wood pole or solid surface where the wiring cannot be routed through the regular wire routing hole on the back of the Navigator. 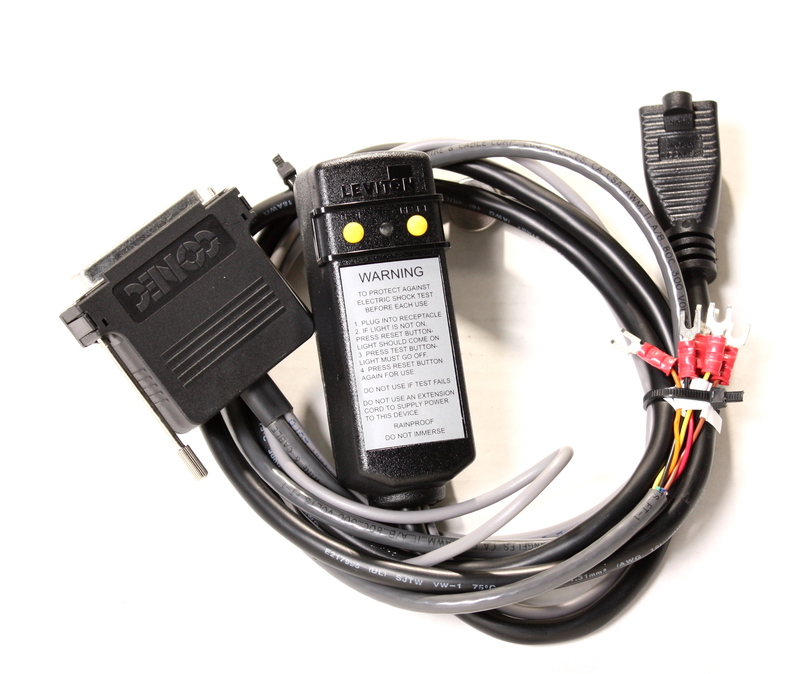 Part number for ordering is EZ521-X. To designate color in place of X use "B" for black, "G" for green and "Y" for yellow. This is a custom cable harness that works in conjunction with a CCU2EN to allow quick set up of EN2 push button stations in a shop environment, without the CCU2EN having to be connected to a Traffic Control Cabinet. The part number for ordering is EZ220. 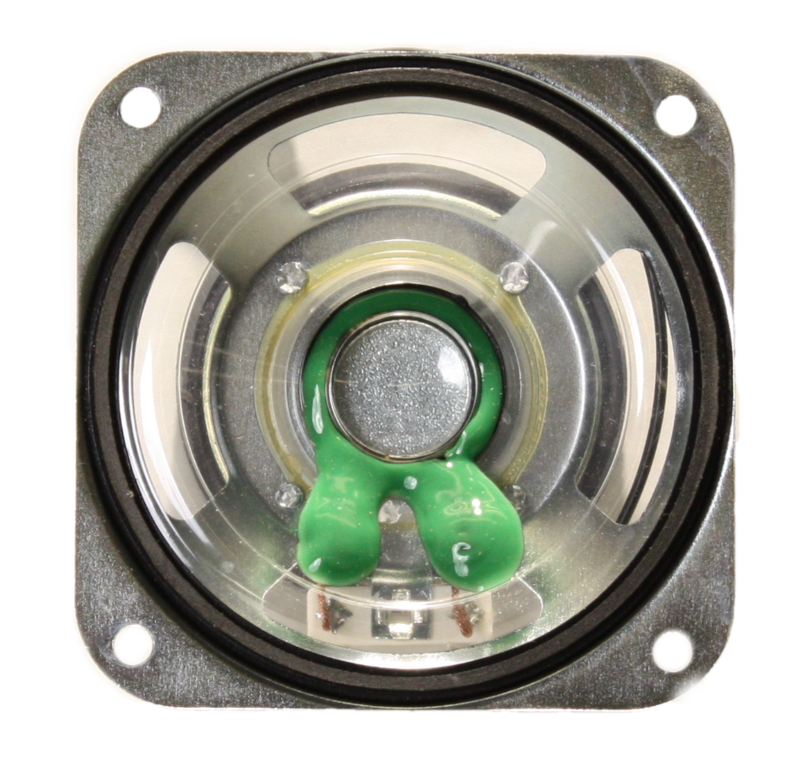 This is an external horn style speaker that typically installs on a PED Head for the purpose of providing greater directed volume on large intersections, or beaconing on intersections. Part number for ordering is 2WEXTSPKR. This external speaker is connected to a Navigator EN2 or EN4 Push Button Station (PBS) with the -ES option (see below). 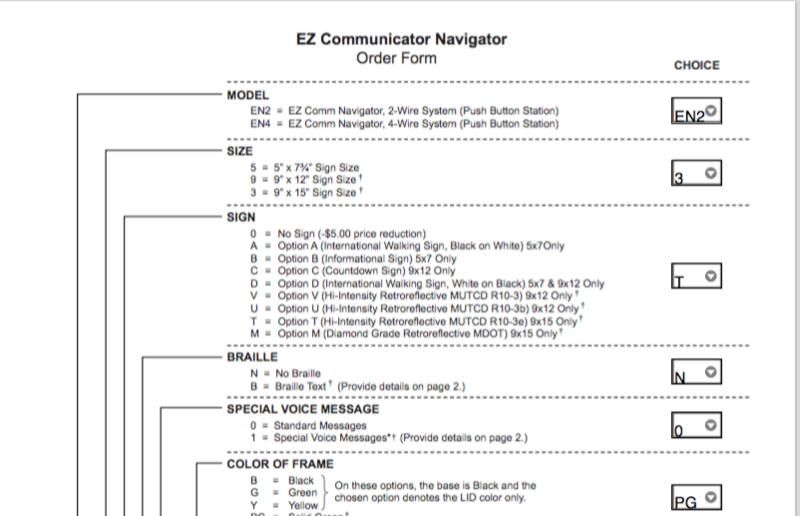 The EN Navigator PBS must be ordered with the -ES option in order for this external speaker to work in conjunction with the PBS. If an external speaker is going to be used the EN Navigator PBS must be ordered with this -ES option. This -ES option requires that a different circuit board assembly which has additional components and amplifier, be installed in the PBS during assembly. On the Part Number order sheet there is a location for this -ES option to be entered to ensure you get this option included in the EN2 or EN4 Navigator PBS . 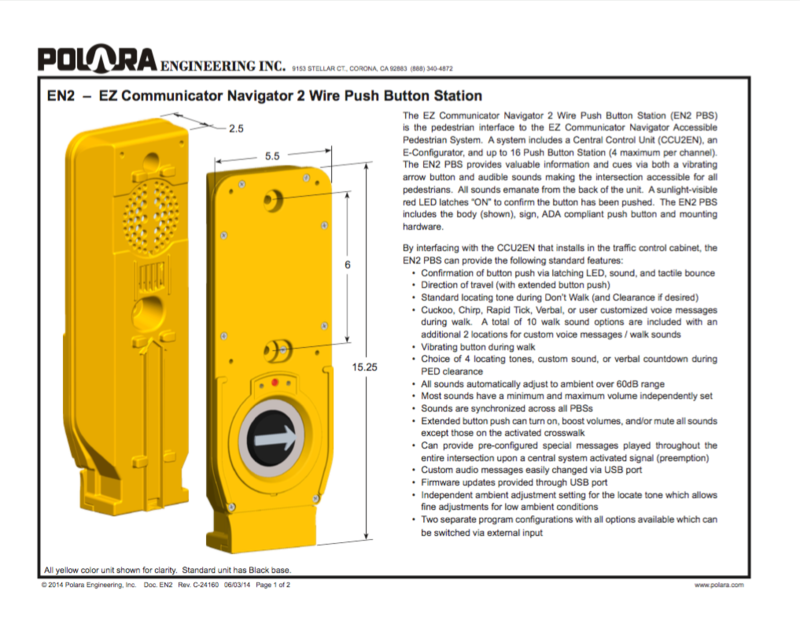 An EN2 Navigator PBS can be ordered with this -EB option which includes additional components and a terminal block to allow a standard contact closure button, or Polara Bulldog button to be connected to the EN2 PBS and put in a call. 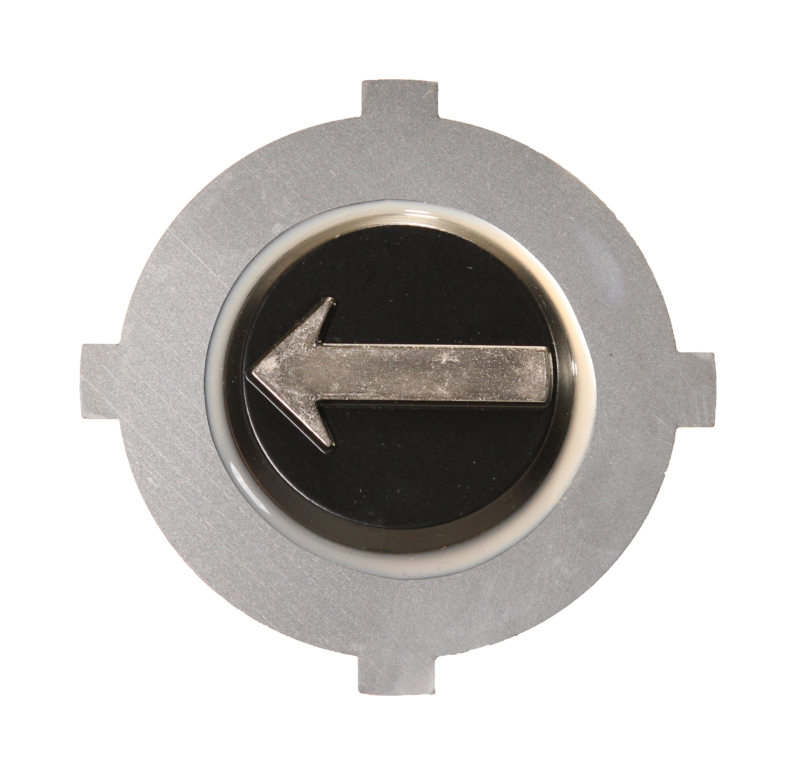 This external button option is typically used for bike lane buttons, horse crossing buttons, or custom configurations where a second button is needed in addition to the Navigator PBS. On the Part Number order sheet there is a location for this -EB option to be entered to ensure you get this option included in the EN2 Navigator PBS. Note: This option is not required on EN4 Push Button Stations. On an EN4 the external button wires can simply be connected to the EN4 button wire terminal block. This is a special firmware option applicable only to Canada. On the Part Number order sheet there is a location for this S02 option to be entered to ensure you get this option included in the EN2 Navigator PBS . 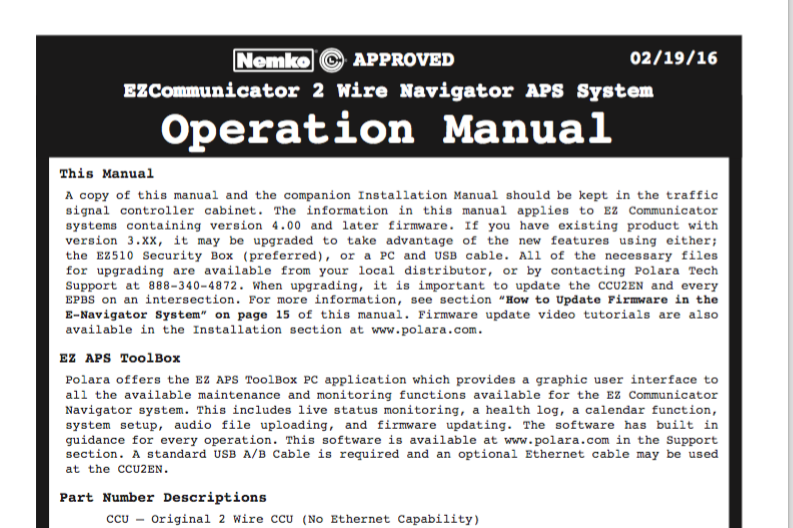 This is the complete manual on the Installation of a 2-Wire Navigator System. A copy of this manual and the companion Operation Manual should be kept in the traffic signal controller cabinet. 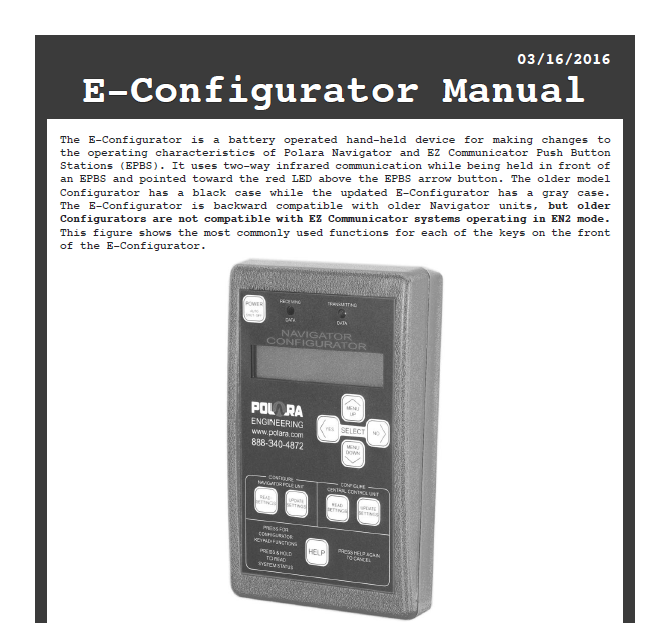 The information in this manual applies to EZ Communicator systems containing version 4.00 and later firmware. This is the complete manual on the Operation and Features of the 2-Wire Navigator system. A copy of this manual and the companion Installation Manual should be kept in the traffic signal controller cabinet. 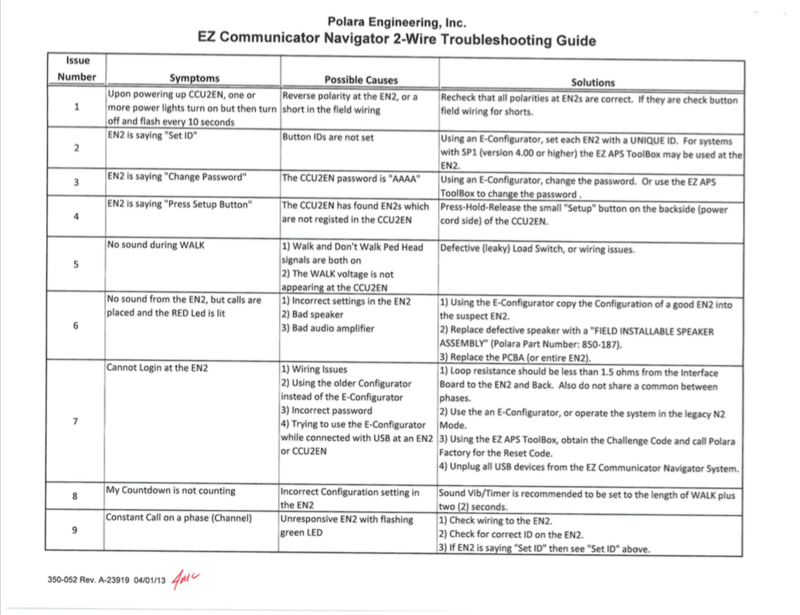 The information in this manual applies to EZ Communicator systems containing version 4.00 and later firmware. 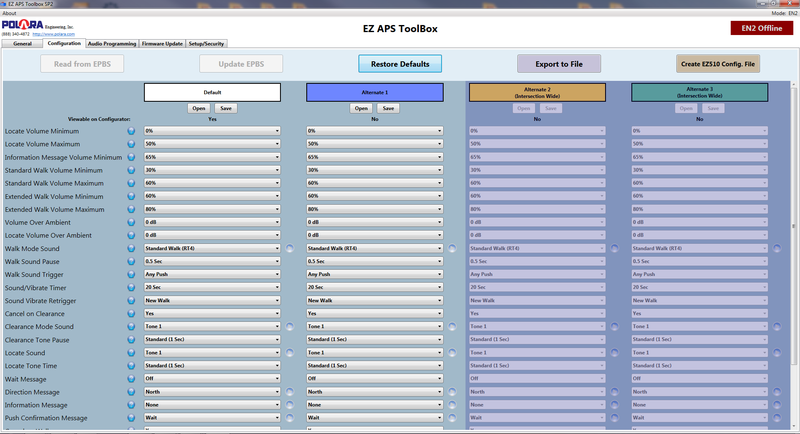 This is the Toolbox for use with EN2 and EN4 products. 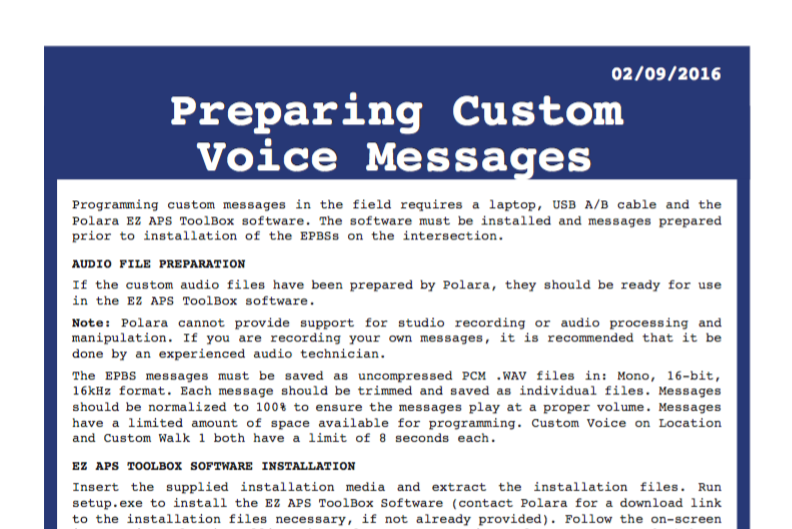 Programming custom messages in the field requires a laptop, USB A/B cable and the Polara EZ APS ToolBox software. The software must be installed and messages prepared prior to installation of the EPBSs on the intersection. 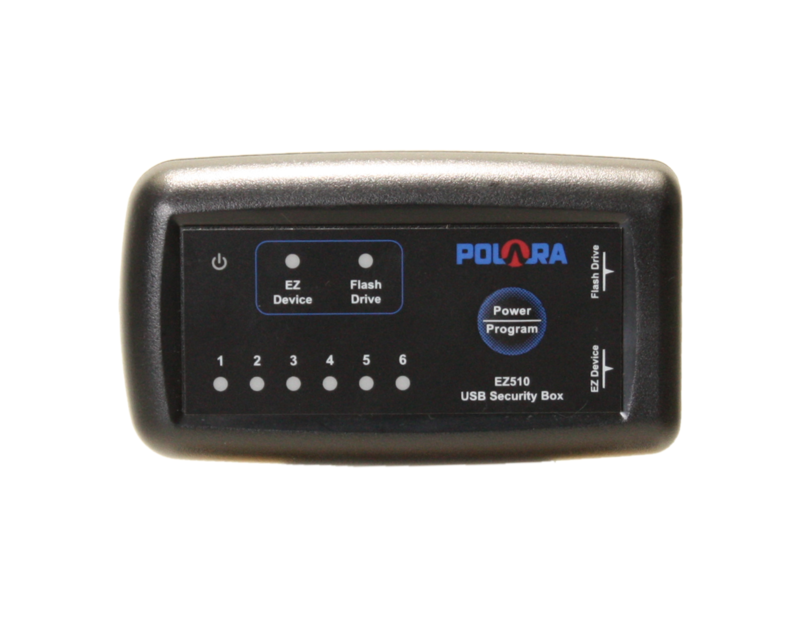 The CCU2EN comes with the IP address statically assigned to 192.168.1.223 to allow for easy configuration from a laptop. 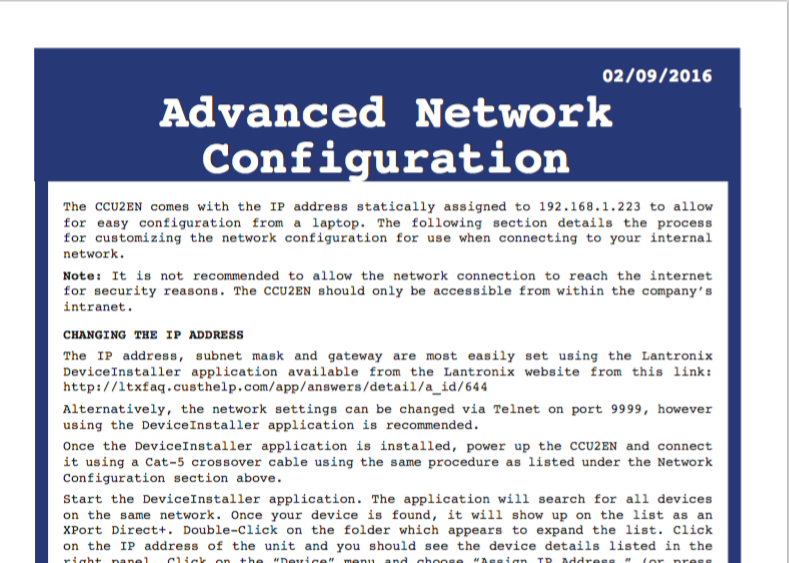 This document details the process for customizing the network configuration for use when connecting to your internal network. The firmware update files available here are to correct an issue with some CCU2EN's where the MAC address gets reported incorrectly preventing multiple CCU2EN's from communicating on the same network. If you encounter a CCU2EN that has issues networking to the central office, please download the firmware files from the link below and update the firmware by following the steps in the Readme file also included with this link. 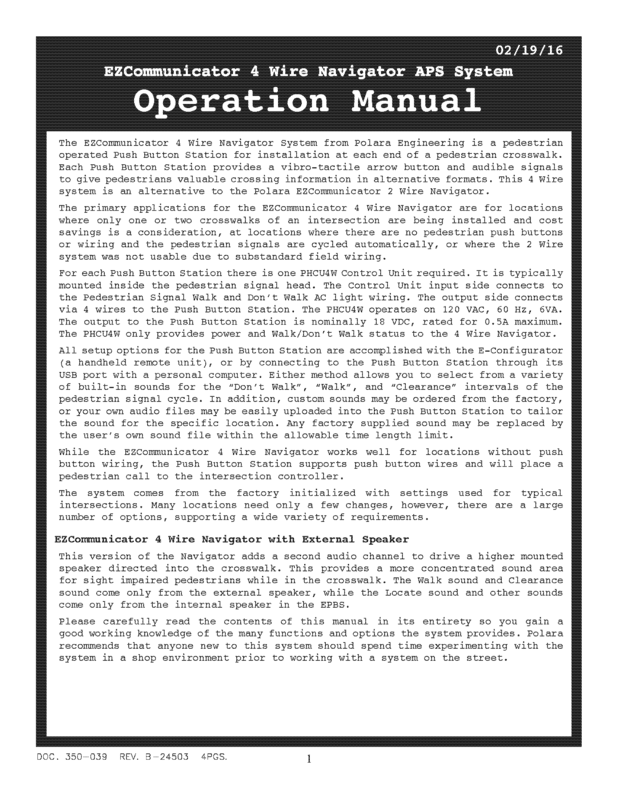 Operation Manual for the E-Configurator handheld configurator. 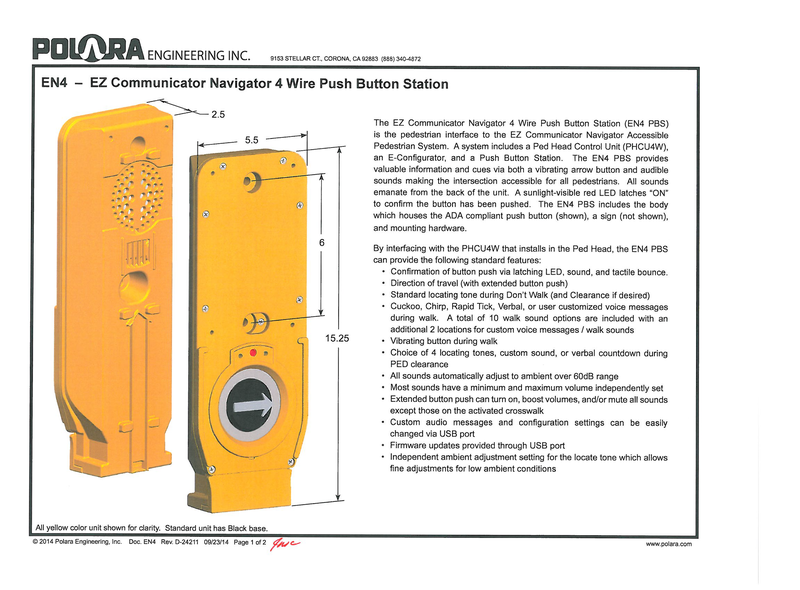 This document provides technical information on the EN4-Wire Push Button Station. This is the Control Unit that mounts in the Pedestrian Signal Head (PED Head), takes power from the 120 VAC power to the walk/don't walk light signals, and operates the Push Button Station via 4 wires that connect the Control Unit to the Push Button Station. One Control Unit is required for each Push Button Station. The accessories listed below are applicable only to the EN4. All accessories shown under the EN2 Accessories section are also applicable to the EN4 unless otherwise noted in the description. Click (here) to go to EN2 Accessories section. This cable is used to connect a PHCU4W to an EN4 Push Button Station. Part number for ordering is 850-288-25. 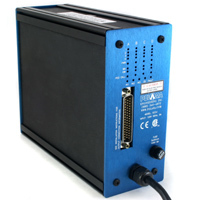 This Set Up Box is a tool for use in operating through all phases, one or two EN4-Wire Push Button Stations in a lab/bench top environment, without needing a Traffic Cabinet and PHCU4W. It allows easy programming of messages, or setting of configurations prior to installation on an intersection. This is a special firmware option applicable only to Canada. On the Part Number order sheet there is a location for this S03 option to be entered to ensure you get this option included in the EN4 Navigator PBS . 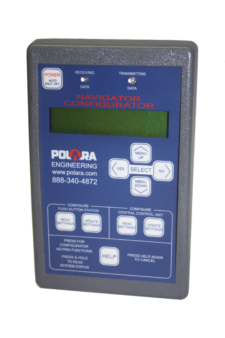 This is the complete manual on the Installation of a 4-Wire Navigator System. A copy of this manual and the companion Operation Manual should be kept in the traffic signal controller cabinet. 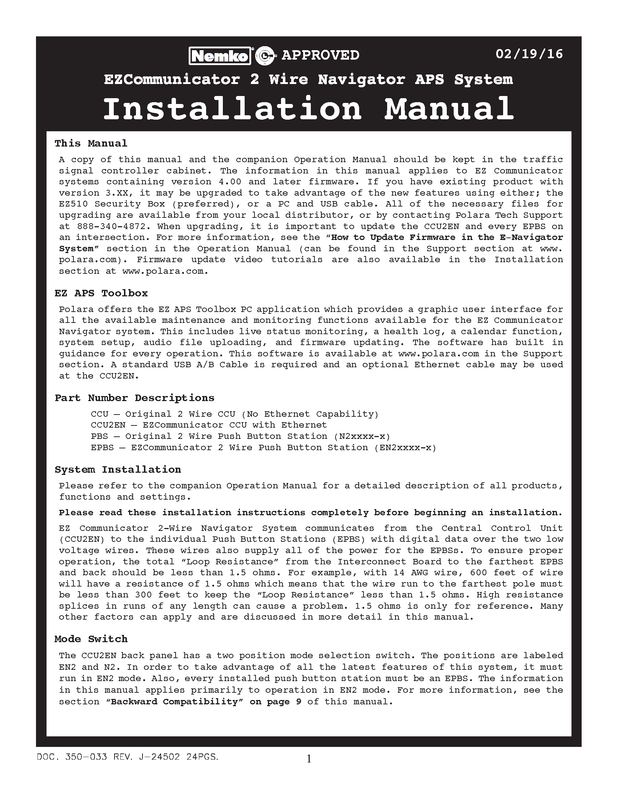 This is the complete manual on the Operation and Features of a 4-Wire Navigator System. 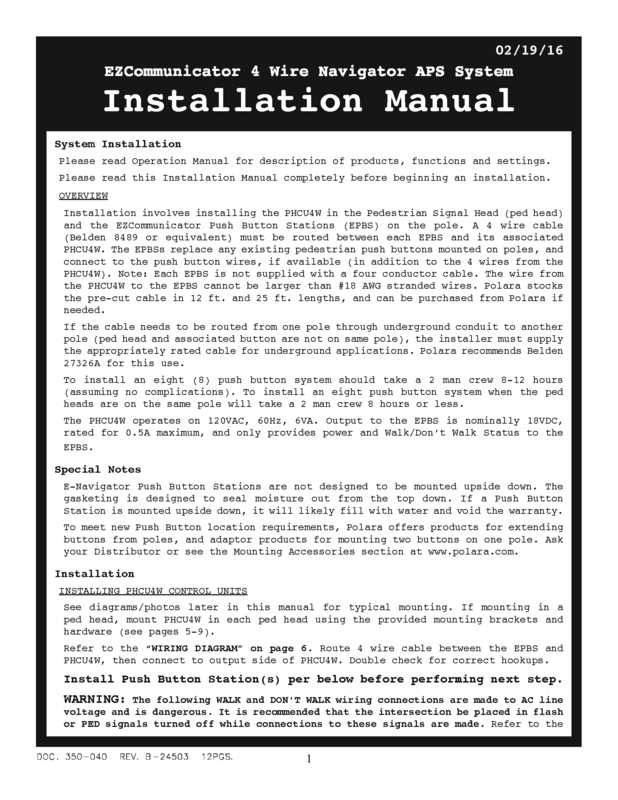 A copy of this manual and the companion Installation Manual should be kept in the traffic signal controller cabinet.